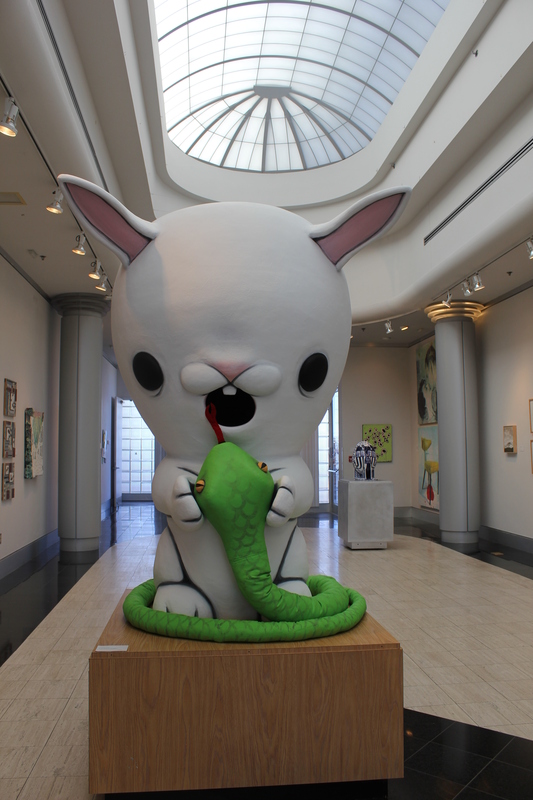 Sink your teeth into stunning art, like Justina Ortiz’ “Great Rabbit” at SBCC. In its 45 years in Albuquerque, the Tamarind Institute, an internationally renowned lithography center, has drawn visiting artists from all over the world to participate in its residency programs. Upon leaving the Tamarind, what did many of them refer to in its guestbooks? The Frontier Restaurant and green chile. That’s right—after spending time at a premier arts institution, these artists chose to dedicate their parting words (or images) to local food. 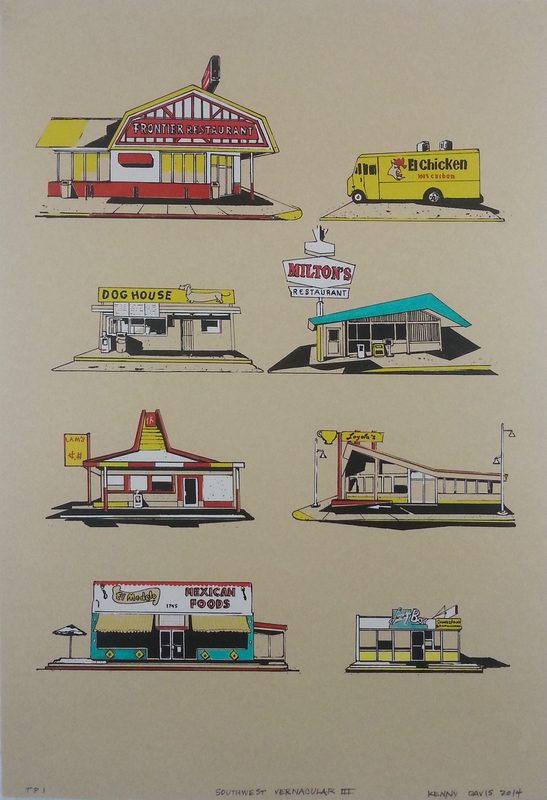 This unexpected homage, discovered in preparation for an anniversary exhibition slated for later this year, sparked an idea for another exhibition—Foodie: On Eats, Eating, and Eateries in Albuquerque. It’s a fascinating example of how context permeates and is shaped by art and art-making. This is one of the key ideas behind On the Map: Unfolding Albuquerque Art + Design, a citywide event organized by over 20 partnering cultural institutions to present the history and trajectory of art in central New Mexico. Foodie, on view at the Tamarind (2500 Central SE) from March 6 to May 15, is just one of 22 On the Map exhibitions taking place between now and June. A handy brochure, available at all participating venues, plots the events on a map—but it’s still a lot to navigate. Grouping the exhibitions into loose categories that highlight connections and similar themes makes this massive event a little easier to digest. To kick off On the Map, here are four thematic “paths” featuring exhibitions that open now through March. Before setting out, get your bearings with a general overview of regional art. Visualizing Albuquerque: Art of Central New Mexico, which runs from Jan. 31 to May 3 at the Albuquerque Museum (2000 Mountain NW), is On the Map’s guiding compass. “An umbrella” for partner exhibitions, it covers some 12,000 years of making in central New Mexico and introduces historical and contemporary trends. For extra insight, catch the lecture by curator Joseph Traugott at the 1pm opening reception on Saturday, Jan. 31. All Over the Map: The Ongoing Dialogue of Public Art, a collaborative exhibition put on by the City of Albuquerque and Bernalillo County Public Art Programs, opens at the museum the same day. Meanwhile, The Bomb, on view until Feb. 28 at the South Broadway Cultural Center (1025 Broadway SE), focuses on contemporary art production and provides a look at how regional artists are experimenting with style, subject and media. For an eclectic sampling of work by local designers and architects, visit From the Ground Up: Design Here + Now at 516 ARTS (516 Central SW) from Jan. 31 to April 11. At the opening reception from 6 to 8pm on Jan. 31, five UNM dancers will perform a piece choreographed by Lisa Nevada that explores the relationship between the body, the ground beneath and the space above. While making art is certainly a personal and introspective activity, any number of outside forces also shape artistic production. Homebound: The Art of Isolation, which runs Jan. 23 to Feb. 27 at OFFCenter Community Arts Project (808 Park SW), presents work by artists who are confined to their homes for reasons ranging from illness to disability to house arrest. The Art is Not Mine: The Jonathan Abrams and Fay Pfaelzer Abrams Art Collection, at the UNM Art Museum (203 Cornell NE) from Feb. 21 to May 23, introduces a selection of work donated by two local collectors who have impacted arts venues as well as the careers of individual artists. Encompass: 7th & Mountain, at the Harwood Art Center (1114 Seventh Street NW) from March 6 to April 17, highlights the relationship between arts institutions and affiliated artists. 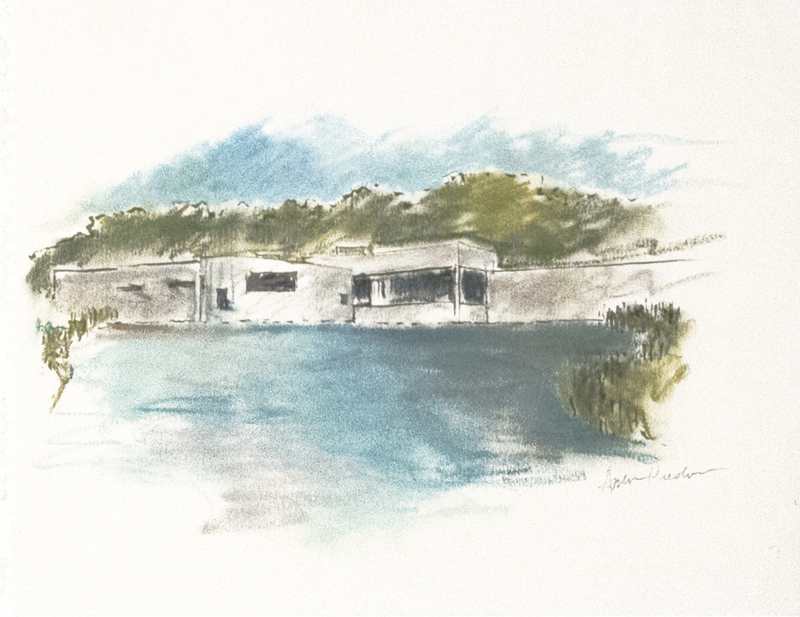 Bryce Hample, for instance, has had a long run with the Harwood—as a child he attended Escuela del Sol Montessori, the Harwood’s parent organization next door, and today he has a studio at the Art Center. There, he produces a range of sound and visual projects that suggest both an affinity for experimentation and a devotion to the ethereal and atmospheric. The Land of Entrapment has lured many artists with a certain enigmatic power that gets the creative juices flowing. “I don't think of New Mexico as a region. I think of it as a force that has entered my system, a force that is composed of many things,” writes Antoine Predock, who established a studio in Albuquerque in 1967. Even when planning a project, Predock looks to the land, finding inspiration in the desert’s geological layers. 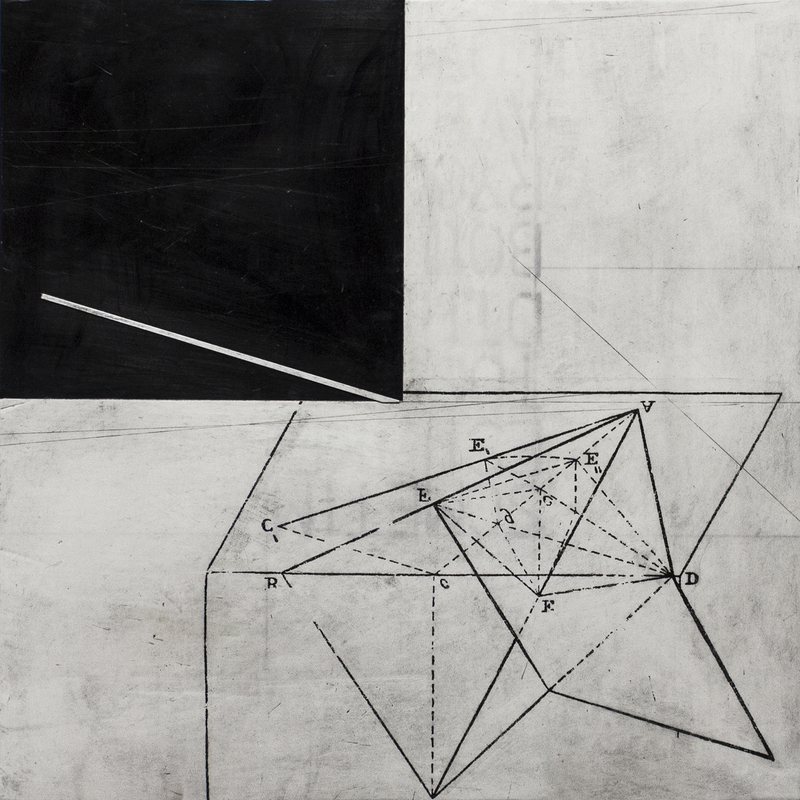 Collages, works on paper and architectural models that reveal his process will be exhibited in Antoine Predock: Strata at Richard Levy Gallery (514 Central SW) from Jan. 31 to March 13. 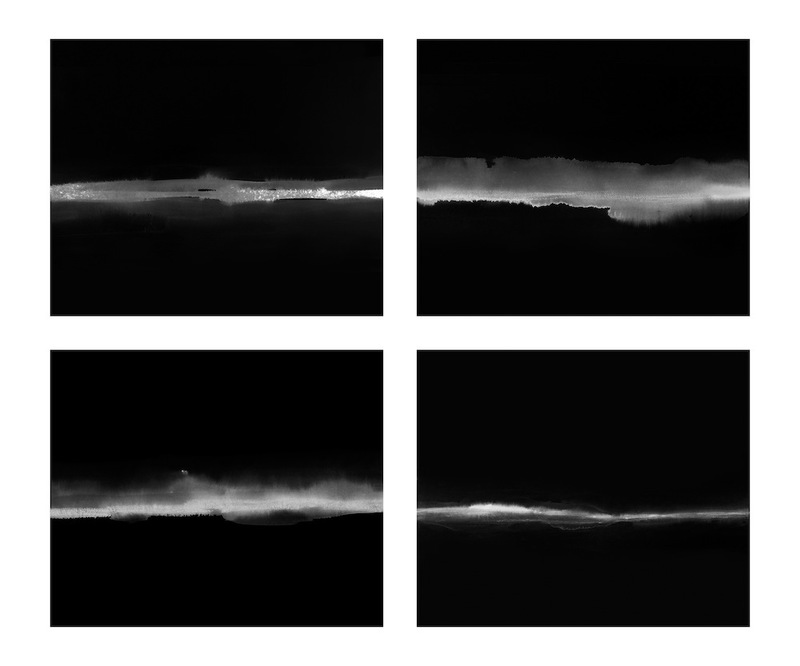 Middlescapes, at April Price Projects Gallery (201 Third Street NW) from Jan. 31 to April 30, features other artists who look to the landscape for inspiration and creative nourishment. While some works shout New Mexico, like Gus Foster's panoramic views of the Sandia Mountains, others, such as Marietta Patricia Leis’ color-rich abstractions, subtly communicate its essence. 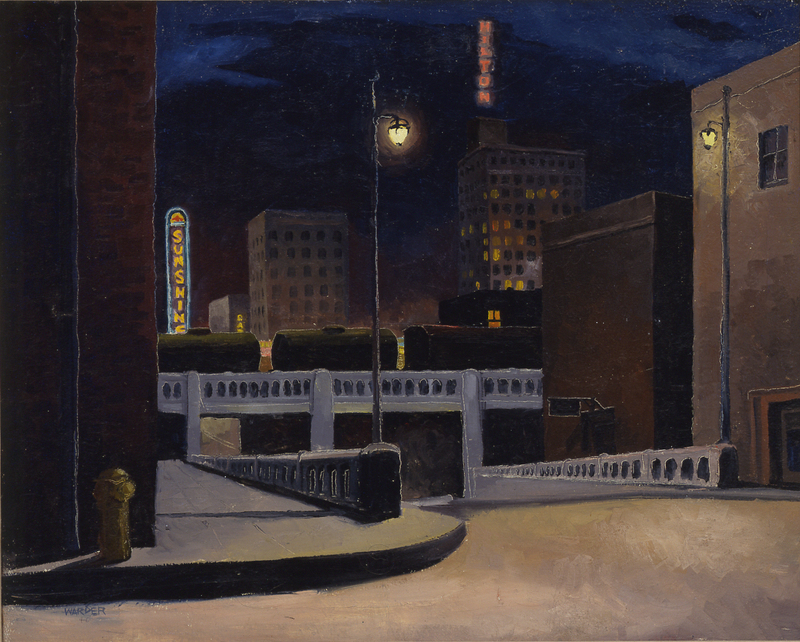 Modern painter Raymond Jonson also felt the allure of the land; it spurred his move from Chicago in 1924 and continued to impact his life and work throughout his career. 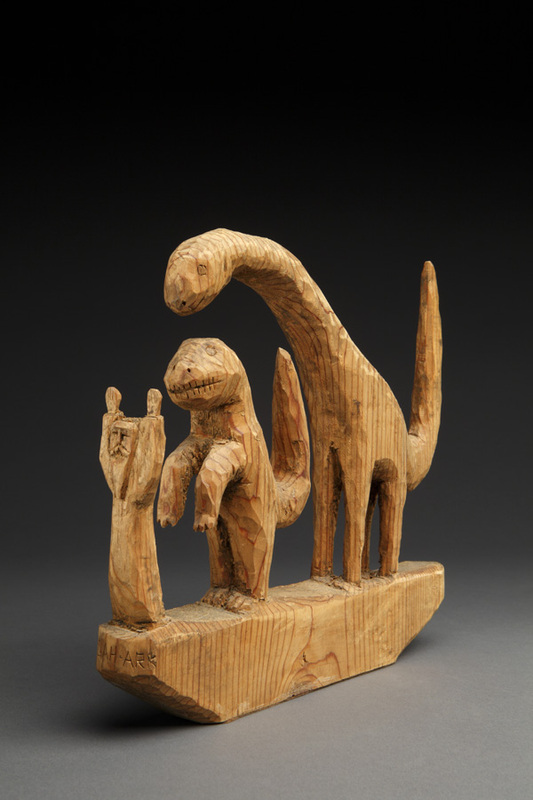 Pure Feeling: Raymond Jonson in Albuquerque, 1934-1978, at the UNM Art Museum (203 Cornell NE) from Feb. 21 to May 23, highlights Jonson’s stint as a UNM professor and his involvement in the local art scene. Several On the Map events are solo and group exhibitions of regional artists, many of whom draw from local context, history and tradition to define and hone their own personal style or approach. Bringing together the work of past icons and contemporary artists, Impetus Seekers: Integral Innovations of Pueblo Women Artists, organized by the Indian Pueblo Cultural Center and on view at the KiMo Theatre Gallery (421 Central NW) from Feb. 6 to March 6, is a study in the evolution of tradition. Three of the featured artists, Margarete Bagshaw, Helen Hardin and Pablita Velarde, have familial ties (Bagshaw is the daughter of Hardin and the granddaughter of Velarde), illustrating the balance between preserving legacy and cultivating individual expression. Take in Michael Naranjo’s work at VSA North Fourth Art Center. MARCO! : Celebrating the Legacy of Nuestro Maestro Marco Garcia presents over 50 carvings depicting saints, heroes and local lore by woodcarver Marco Garcia. 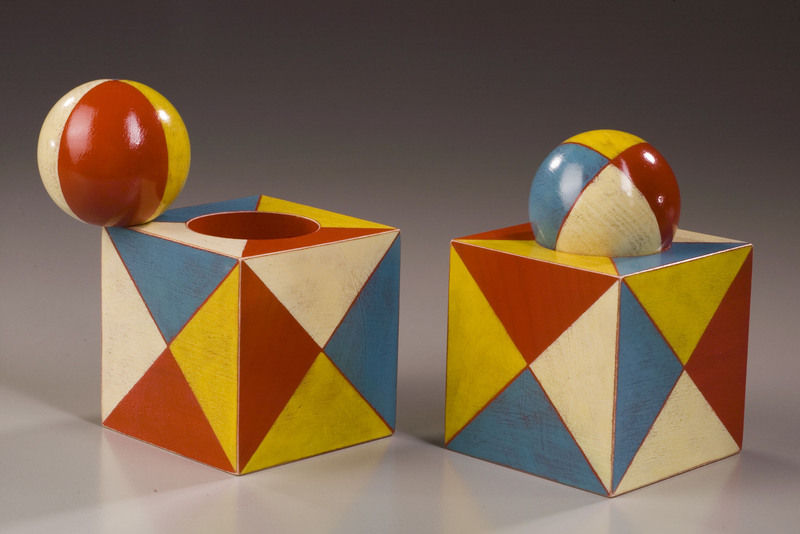 Bolstered by a following of fans and collectors who bought his work at the Albuquerque flea market and the State Fair, Garcia built a career outside of the gallery scene. Visit his first solo exhibition at the National Hispanic Cultural Center (1701 Fourth Street SW) from Feb. 20 through the end of June. 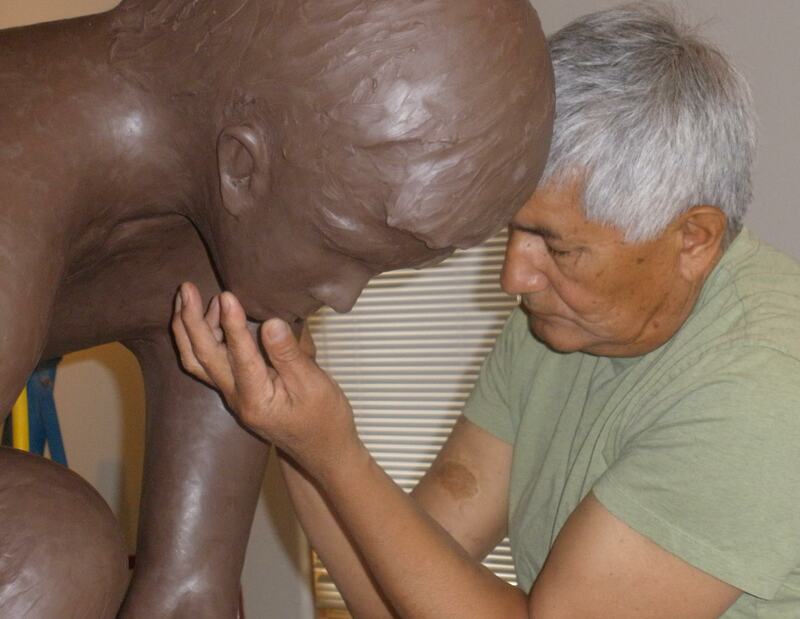 Down the Line, at the VSA North Fourth Art Center (4904 Fourth Street NW) from March 23 to May 4, is a retrospective of work by sculptor Michael Naranjo, who has been blind since age 24. Naranjo’s sculptures depict subjects rooted in his Tewa heritage, but his intuitive touch lends them a characteristic supple sleekness. These paths provide just an initial guide to On the Map—there are several more exhibitions worth investigating between now and June. Have fun with them. Take detours. Get lost. Let one path lead to another. And as you explore, consider what makes Albuquerque, and its art, distinctly Albuquerque.